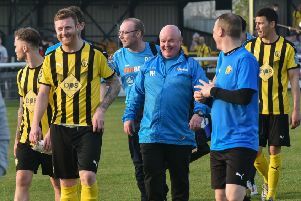 Quickfire goals at the start of each half put Leamington on the way to victory in their crucial six-pointer at home to fellow strugglers Gainsborough Trinity on Tuesday evening, writes Paul Okey. Loan signing’s Daniel Udoh’s second of the game in injury time made the victory look a lot more emphatic than it was but there were few home fans complaining after seeing their side record their first league win in six. Kaine Felix and Daniel Udoh celebrate Brakes' opener. Saturday’s defeat at Alfreton was quickly forgotten as Brakes came racing out of the blocks, penning their visitors back inside their own half before breaking the deadlock in the fourth minute. Two crosses had been half-cleared by Trinity before Kaine Felix’s delivery caused panic on the edge of the six-yard box, Udoh driving the ball through a sea of bodies to open his account for Leamington. Gainsborough keeper Heinrich Ravas clung on well to a long range Callum Gittings effort as Brakes remained on the front foot and a defender was then in the right place to block a Kieran Dunbar effort inside the box after Felix’s pace had caused havoc down the left. Despite the hosts’ dominance, they nearly shot themselves in the foot in the 19th minute when a misunderstanding between Junior English and Connor Gudger allowed Nathan Jarman to get on to a ball forward. However, not trusting his pace, the striker opted to take on a first-time shot and his half-volley slid past the far post with Tony Breeden scrambling. Tensions boil over in the Gainsborough camp. A Dunbar effort was comfortably dealt with by Ravas before Jack Edwards blasted over after showing good footwork to create space for the shot. Breeden, looking to atone for his horror show three days previously, then pulled off a superb block to deny Tom Davie, racing off his line to narrow the angle after Liam King’s shot had deflected across to him. The tension was clear to see from both sides and the game remained frenetic, with both sides trusting attack as the best form of defence. An Ashley Worsfold flick-on from a Simon Russell cross evaded two attackers at the far post by inches, while at the other end a rasping Dunbar strike drew a smart parry from Ravas. Gittings drove forward and shot wide after Brakes had won back possession in midfield with Dunbar screaming for a pass to his right. Dunbar then allowed a gilt-edged chance to make it 2-0 pass him by. Udoh was bundled over by Nathan Stanfield in the box but with the ball running through to an unmarked Dunbar, referee Ben Cooke allowed play to continue. But instead of sliding the ball into the empty net, Dunbar miscontrolled it, sending him wide and after further dithering his shot was charged down by the covering defenders. Jarman took a break from lambasting his own players to slide a free-kick past the angle to bring a busy first half to a close. The second half was just over a minute old when Brakes doubled their advantage. Felix showed good pace to get to the byline and his cross with the outside of his right boot was deflected over Ravas by the backtracking King. The second goal took a little bit of sting out of the contest and although the challenges continued to fly in, there were fewer goalmouth incidents as Brakes were prepared to let Gainsborough play in front of them. A shot out of nothing from King rattled the crossbar with Breeden beaten, while a Jarman strike was adjudged to have been deflected behind by Worsfold. Brakes were looking dangerous on the counter but from one such break, Udoh took too long to get a shot off, allowing Trinity to block the ball for a corner. Edwards then fired in a fierce strike from the resultant corner which was cleared off the line by Michael Jacklin. Former Brakes loanee Worsfold headed well over from a cross from the left but there were few scares for Brakes as the game moved into the closing stages. Another Leamington breakaway saw substitute Liam Canavan release Dunbar on the right, but with the midfielder struggling to bring the ball under control he wastefully fired into the stand. With the three points already wrapped up, Brakes were handed an unexpected bonus in injury time when Udoh doubled his tally. Ravas looked less than comfortable dealing with a backpass and Udoh was rewarded for his closing down when the keeper’s clearance hit him and rebounded into the empty net. A mistake from Jamie Hood almost allowed Trinity a consolation but Breeden was in no mood to give up his clean sheet, beating away a close-range strike from Alex Simmons before watching King fire the rebound high and wide.